Stress hormones run rife when we watch a game – and that can make the difference between fun and aggression, writes Olivier Oullier. Last Sunday, I flew home to France to watch Les Bleus defeat Croatia 4-2 in the final game of the 2018 World Cup in Russia. My daughters were not born in 1998, when France won its first World Cup title and I wanted to share that moment with them and for me to be part of the memory their brains might carry for the next decades. Football is fascinating to me. Not just as a sport but above all, because of what it triggers in people, in all of us who love that game. 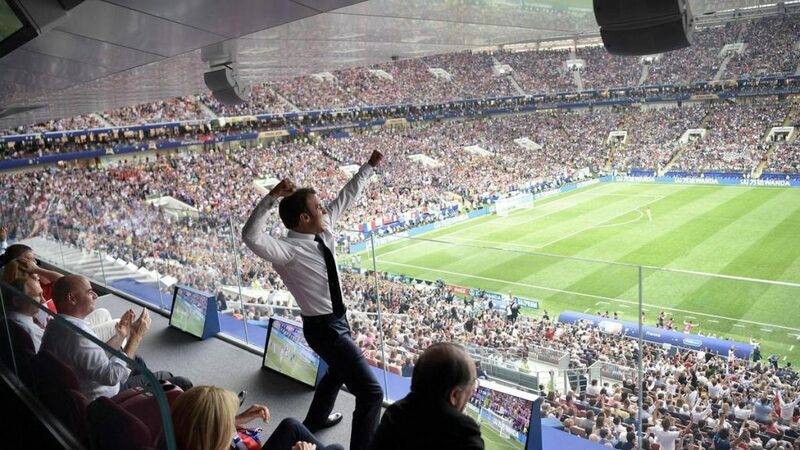 You can find them in every sector of society, from factory workers to heads of state, as beautifully illustrated by the now iconic picture of French President Emmanuel Macron punching the air in jubilation during last Sunday’s final. To my knowledge, they are the only people willing to take days off work, ride a bus for 15 hours to support their team in some obscure game in the cold and get back in time to be at their office desk. They are also able to worship a player one day and insult him two weeks later. What is happening in the brains and the bodies of football fan that could explain their behaviour? Supporting a football team is a great illustration of coalitional psychology and in-group loyalty at play between groups of fans, leading to great fun – but also, at times, to aggression. In 2015, a group of researchers from the Department of Social and Organisational Psychology at VU University in Amsterdam, led by Leander van der Meij, made fans watch a game of their favourite team being beaten by their arch rivals. The researchers observed an increase in anger and aggressive behaviour when the fans perceived the result of the game as unfair, especially when their perception was that the referee was responsible for the outcome. However, if their sense was that their favourite team was to blame for the loss, aggression was considerably lower. The latter is in line with a study published by scientists from Tubingen in Germany that revealed that fandom does not lead to a bias in perception of what happens on the pitch. However, retrospective judgments about the game are clearly distorted by team allegiance. One of the reasons is the variation of certain hormones in the bodies of fans as they experience a game. Further light is shed on this role on the behaviour of football fans by another study Van der Meij and colleagues conducted on Spanish fans during the final of the 2010 World Cup, when the national team beat the Netherlands. More precisely, they monitored the changes in cortisol and testosterone, two steroid hormones respectively associated with stress and aggressive behaviour. The first observation was that the cortisol level correlated with the level of fandom. In other words, fans stress more. The study also found testosterone levels of fans watching the game increased while “cortisol secretion among young and greater soccer fans suggests they perceived that a negative outcome of the match would threaten their own social self-esteem”. Self-esteem and appropriation are important in sport fandom, as revealed by the tendency of fans to use first person pronouns to speak about victories and third person ones when they discuss losses. Hence “we won” but “they lost”. As humans, we have a strong need to belong. Being a sports fan fills that need for a lot of people, yet it is very often rooted in nothing rational. Arbitrary allegiances to teams are at the core of fandom. One of the reasons a lot of people support a football team has nothing to do with the way they play but because the supporter was born in the city of that team. If you happen to be in France soon, or the next time you meet French people, ask what they were doing on July 12, 1998, the day France won its first ever World Cup. I imagine they will remember that moment vividly. Back then, I did not fully enjoy it as I was preparing for my masters degree. But last Sunday, as the French football team became world champions for the second time, it was different. I was cheering and screaming with my daughters and got even more hugs and kisses from them than usual. Like millions of other people, I did not suffer from any fandom menace: I just benefited from the emotional contagion that goes with a world cup win, one of the very few positive events that makes global headlines.